Do you want to practice speaking English? In this lesson you'll watch me have a conversation with a kid. Speaking with children is good because they are easy to talk to, have good grammar, and have a lot to say. You also don't need to feel nervous when you speak with them. I'll teach you some easy ways to start conversations with kids. I'll also tell you what kind of behavior kids DON'T like from adults. In this video, my young friend, Mohamed, will have a conversation with me so that you get a real example of what conversations with children are like. Speaking with children can be a great way to practice your English and learn slang! 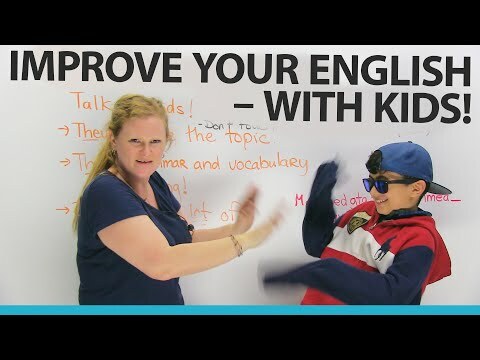 www.engvid.com/practice-your-english-by-speaking-with-kids/ TRANSCRIPT Hi there. Do you kind of have a hard time speaking English? So maybe you've studied English in your hometown, or at a school, or online at www.engvid.com, and you think that your grammar's pretty good, and... You're just shy. And maybe you live in a country and you don't have English speakers around you, and you don't know how to practice speaking. So, there's one really wonderful resource-it's not a textbook, it's not a webpage, and it's not on YouTube-it might be living in your house. It could be beside you, it could be next door, or it could be in the park. Do you know what this is? It's a child, or children, and we like to say "kids". So, I'm going to teach you how to improve your speaking without really doing too much or spending a lot of money. This is the trick: Talk to kids. They are amazing. Kids will always want to talk to you, because they are fun, amazing guys. So, it's really easy to talk to kids, because first of all, they choose the topic. You maybe are: "I don't know what I'm going to say to this person", so if you... If you see an adult, or someone who goes to your school, and think: "I don't... What...? What am I going to talk about? I... I... I don't... I don't... I don't know." Kids just choose the topic, they just talk to you about whatever they want, so that's cool. Another thing about kids is if they're learning English, if you're in Canada or an English-speaking country, luckily enough, children are learning vocabulary and they're learning grammar. Now, their brains are like sponges. They learn, the teacher corrects them. Their grammar is absolutely perfect, with a couple exceptions. They will learn and they will be able to correct themselves. So, their grammar and vocabulary is amazing. It might be a little bit better than mine. A little bit, not that much. And the last thing is children know, this says: "a lot of slang". If you look at a lot of new videos or music, kids listen to this music, and that's where we get slang from; we get it from performers who make new words. So, kids know a lot of slang, and to you, they know new words. One of the big problems that a lot of people have when they come to an English-speaking country is that they've learned older words. Maybe they learned from an older person, or they have old textbooks. What happens is we don't use those old words anymore, and when we do, the person kind of looks at you weird because that's a really old word. So, what you want to do is you want to find a child. Oh! Where could I find a kid? Here's a kid now. Hah. Huh. What's your name? Mohamed: Mohamed. Ronnie: Oh, hi, Mohamed. Where are you from? Mohamed: Libya. Ronnie: Wow. I've never been to Libya. How is it? Mohamed: It's pretty sunny, and it's pretty extremely hot there. Like, it's pretty hot. Like, you can go to the beach every single day. Ronnie: No way. Mohamed: It is actually possible, if you want. Ronnie: How's the beach? Mohamed: It's, like, I can swim there for 25 hours, and I will be tired. Ronnie: 25 hours, that's a lot. And what about the water? Is it clean? Mohamed: Yes. Ronnie: It's really clean? Mohamed: Yeah. Ronnie: Yeah? Mohamed, if somebody talked to you and they said: "Oh, hi, how are you? How are you? How are you?" How do you feel about that? Mohamed: That's annoying. Ronnie: Oh, oh, okay. I'm sorry. And... And what if somebody told you what to do, like: "Hey, you, sit down. Stand up. What are you doing?" How do you feel if someone said that to you? Mohamed: That means they're just bossy people that want attention. Ronnie: Oh, that's a good point, yeah. Do you like people like that? Mohamed: No. Ronnie: No. Would you want to talk to them? Mohamed: No. Ronnie: Okay. Mohamed: I would like to have better friends that actually do good things. Ronnie: Yeah, that's a good idea. Do you know people that do good things? Mohamed: Yeah. Like, pretty much all of my friends, and mostly my mom. Ronnie: Oh, your mom does good things? Mohamed: Yeah. Ronnie: Aww. Mohamed: Yeah, she does a lot of things to me. Ronnie: Yeah? That's awesome. Mohamed, what's your favourite colour? Mohamed: My favourite colour is phosphoric orange. Ronnie: Glow-in-the-dark, florescent orange? Mohamed: Yeah. С видео Practice your English by speaking with KIDS! изучать английский язык очень доступно.